We are one of the reputed company engaged in providing superior quality 4 Stroke Bajaj Silencer to our precious clients. The complete array has good demand in the market owing to high quality and durability. Furthermore, it can be availed from us at the competitive rates. 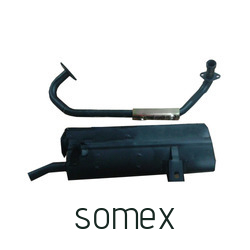 Founded in the year 1978, at New Delhi, (India) we “Somex Industries,” are reputed Manufacturer and Supplier of Motorbike Bend Pipes, Motorbike Silencer And Parts, Three Wheeler Parts, Wheel Rim For 2 W And 3 W and Wheel Rim For Trolley. Our products are manufactured using premium quality raw material, hi-tech technology and modern machines. Products we offer are designed with great accuracy in compliance to meet with the industrial quality norms and to satisfy our precious clients. Further, we offer these products in various shapes, sizes and dimensions in order to meet segregated requirements of our precious clients. Our technical team manufacture these products with precise technical proficiency, assist to enhance products stability, durability, functioning process and ensure longer service life. Our clients can avail these products from us at very reasonable prices.